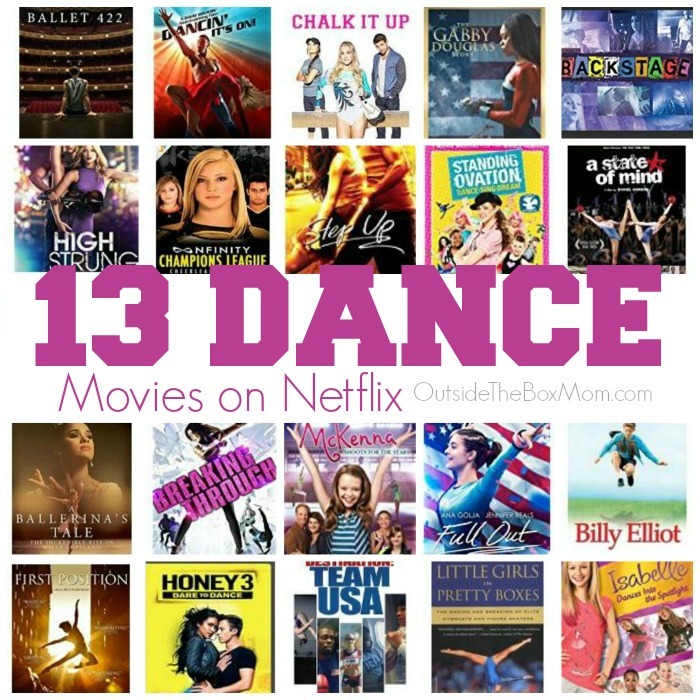 In addition to the gymnastics movies on Netflix I’ve already listed, here are 13 dance movies on Netflix. There were only a handful of gymnastics movies on Netflix, so I also added related dance or cheer movies. 1. Honey 3 Dare to Dance – At a prestigious South African school, Melea and her boyfriend imagine a hip-hop version of Romeo and Juliet, but Melea’s dreams are dashed when she’s unable to pay tuition and is forced to leave. Determined to fulfill her destiny, she does the unthinkable – persuades the community to support her artistic and unique vision. When adrenaline-filled rehearsals cause dance crew rivals and egos to get in the way, everything falls apart. Once again, Melea dares to dream and risks it all to put on a performance you’ll never forget. From the director of Honey and Honey 2, Honey 3 is full of dance, romantic love triangles and heart-pumping music you won’t want to miss. 2. Step Up – Incredible dancing and awesome music fuel STEP UP, the exhilarating and inspiring movie starring Channing Tatum (SHE’S THE MAN, COACH CARTER) who sizzles as Tyler Gage, a rough and streetwise hunk with raw talent. When Tyler finds himself doing community service at a school for the performing arts, he also finds Nora, a beautiful and privileged classically trained dancer who’s searching for a temporary replacement for her injured dance partner. Spying Tyler’s smooth moves, Nora decides to take a chance on him. But as they begin training, tension builds, tempers flare and the differences in their backgrounds explode — igniting this electrifying tale about not giving up on your dreams. 3. Breaking Through – When Casey, a dancer who is discovered on YouTube, gets thrust into the modern world of internet celebrity and culture, she must find a way to balance her true identity with her online persona, or risk losing everything she cares about. 4. High Strung – When a Midwest dancer and a street-wise British musician meet in New York, they immediately clash but there’s an undeniable attraction as well. The two must navigate their differences for a competition that will change their lives forever. 6. Nfinity Champions League Cheerleading Event – The Nfinity Champions League is a group of 30 teams that represent the best of the best in competitive cheerleading. These teams were chosen based on their established records of excellence, then invited to compete and decide once and for all, who among them is the ultimate champion. 7. Dancin’ It’s On – When a Beverly Hills teen visits her distant father at his hotel in Panama City Beach, she encounters much more than she bargained for. She finds herself attracted to the hotel’s dishwasher and together they realize they have something important in common: their passion for dance. While preparing for a dance competition that could forever change their lives, they find themselves battling against scheming dance partners, a meddling father, and their own doubts about their relationship. In order for their chances at winning-and love-to prevail, they will have to overcome their obstacles and dance their way to the top. 8. First Position – This family-friendly doc follows exceptionally talented young dancers from around the world as they vie for jobs and scholarships at a prestigious competition in New York. 9. A Ballerina’s Tale – Iconic ballerina Misty Copeland made history when she became the first African-American woman to be named principal dancer of the legendary American Ballet Theater. Get the incredible, behind-the-scenes story of how she overcame outmoded ballet culture stereotypes and near career-ending injuries to become one of the most revered dancers of her generation. More than just a ballet success story, it’s a hugely inspirational and universal tale of perseverance. 10. Ballet 422 – From first rehearsal to world premiere, Ballet 422 takes us backstage at New York City Ballet as Justin Peck, a young up-and-coming choreographer, crafts a new work. Ballet 422 illuminates the process behind the creation of a single ballet within the ongoing cycle of work at one of the world’s great ballet companies. 11. A State of Mind – It follows two North Korean child gymnasts and their families for over eight months during training for the 2003 Pyongyang mass games. 12. Billy Elliot – (Rated R) a 2000 British dance drama film about a boy becoming a professional ballet dancer, set in north-eastern England during the 1984–85 coal miners’ strike. The film stars Jamie Bell as 11-year-old Billy, an aspiring dancer dealing with the negative stereotype of the male ballet dancer, Gary Lewis as his coal miner father, Jamie Draven as Billy’s bullying older brother, and Julie Walters as his ballet teacher. 13. Little Girls in Pretty Boxes – A sports reporter investigates the training of girls as professional gymnasts and figure skaters, arguing that the pressure to succeed and to look beautiful results in mental and physical harm, from eating disorders to psychological trauma. At the time this post was published, this list was accurate. Netflix titles subject to change without notice. Movies listed are rated G, PG, or PG-13 (or unrated). I made indications of movies with R ratings. Please check the ratings and/or watch these movies before or with your kids. Use your own discretion. Do you have any favorite dance movies on Netflix?